Hurray for the jungles of July! Hi Kim, your jungle is great, we have one too, and it is not as photogenic as yours. I have to remark on your Copper King lilies, they appear to be Chinese trumpets, where did you get them, for I have never seen that variety in the catalogs? I am letting my golden splendor and regale go to seed to try and grow them that way, have you ever done that? Kim your jungle is terrific. It is funny how when it gets hot the garden really gets going in more than one way. Your butterfly weed is gorgeous. I have tried to start that so many times. I have a small start going again this year. I hope it takes. The butterflies will come. 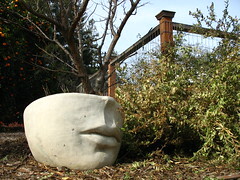 They seem to be just emerging in our garden. There is nothing wrong with a jungle. I love your ice plants and the butterfly weed. I love a good gardener's jungle! 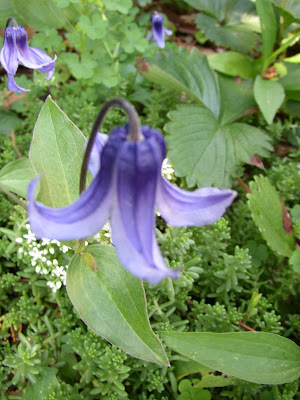 And I must, must, must, must get one of these blue shrub clematis. MUST! I'm going to stop reading bloom day posts, search for it online, and order one now. You have a lot of great flowers right now, and oh, yes, I have some Allium blooming, too, and forgot to include them on my post! 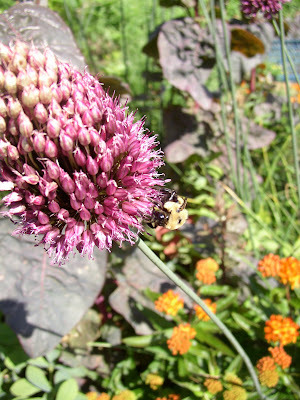 Thanks for giving the Latin name of the Allium. I have that one & I never knew the name as they were bonus freebies. 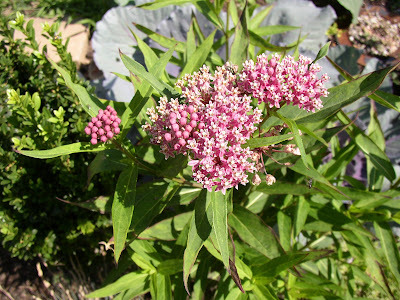 You must have some dumb butterflies to pass on such gorgeous Asclepias(es?). I'm with Carol...I need one of those shrub clematis. My butterflies have been all over my butterfly weed, but have ignored 'Cinderella' as far as I can tell. Weird that they're not going for it in your garden, either. 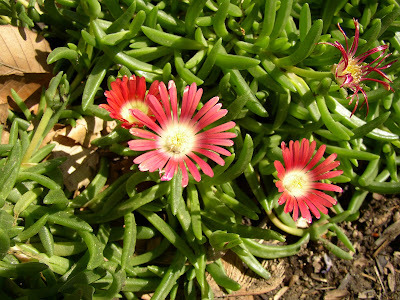 And you've reminded me that I need ice plants. I have so many hot dry spots in my garden in which they would work perfectly. Your garden does look a little cluttered, but I do like the variety of colors and plants that you have in the jungle. 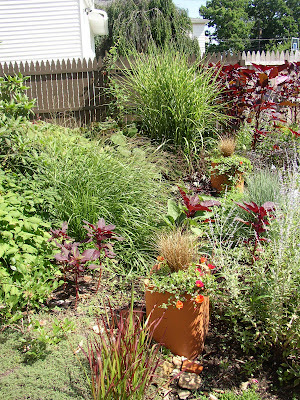 There's nothing wrong with letting your garden grow without your attention. It looks like there's still a path there! 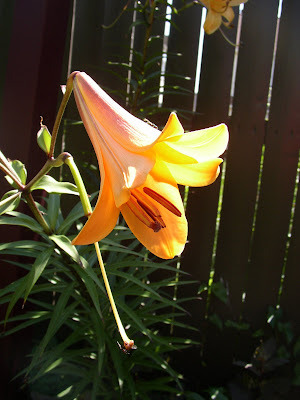 I replied to Frances' questions about the trumpet lilies on your blog, but just in case anyone else is wondering, they were labeled as "trumpet lilies," and I know that I bought them as a package of bulbs at a local garden center. I'm going to search for the original label to see what else I can find out about them. Carol, that's what I thought about your white shrub clematis!!! If only mine wasn't such a baby still, I would have asked if you wanted to trade divisions... *sigh* I'm also glad to see that I'm not the only one who looks at other GBBD posts and thinks, "Oh, no! I forgot X Plant!" Thanks, Gail! And you're so right about the whole GBBD=gardening catalogs idea. I get sooo many ideas from looking at other people's GBBD posts. 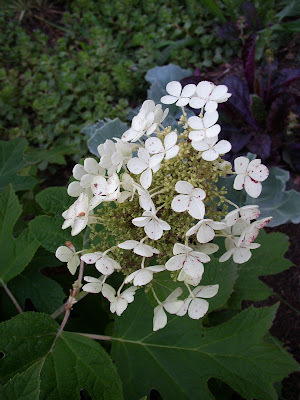 And from yours this month, I learned that monardas are natives--and that gives me license to plant more! Kim, I think your garden is beautiful. 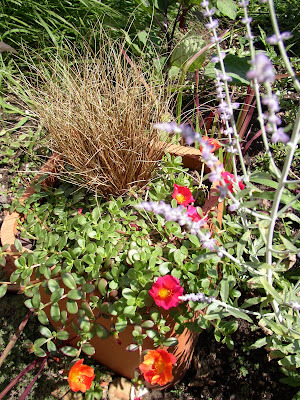 I grow many of the same plants in mine, all drought hardy. I love the salvias and sages too. 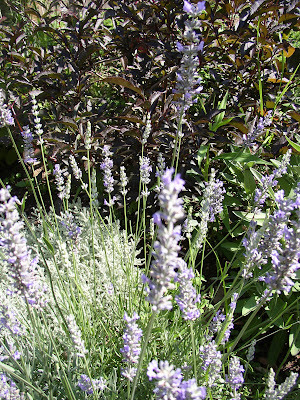 Growing Lavender escaped me for awhile. I couldn't get it enough drainage, but a friend helped me figure it out. I like the way it smells when I brush by it while weeding. July is a jungle indeed down this way - we've had more rain than last year (which is a very good thing) and I was just thinking today how much things...grow...down here. Vines - unwanted vines - all kinds of vines. It gets crazy. 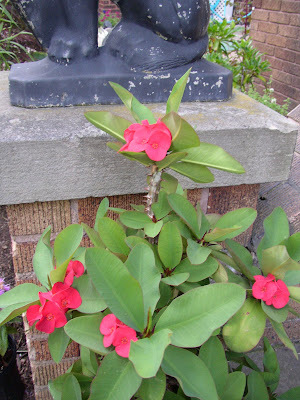 It's always interesting to compare where things 'are' in your garden, compared to mine. 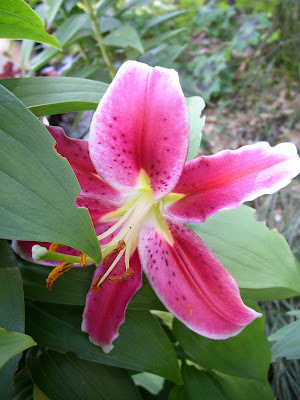 The oakleaf, the lilies - it really is a big difference! It's amazing what kind of... I don't know what to call it, biomass?... that our gardens produce in the course of a season, isn't it? Right now I'm throwing all of the perennial weeds into bags for the city to compost (their piles get hotter than mine, to kill roots and seeds) but I regret not being able to return the nutrients to my own soil. 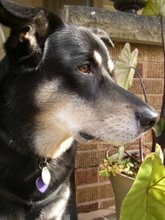 Kim, have you visited Mulberry Creek Herb Farm in person? I was planning a visit to Ohio this summer and thought I might stop by there, but it looks like it's not gonna happen. Anyhow, I've mail-ordered from them in the past and I always enjoy their catalog. 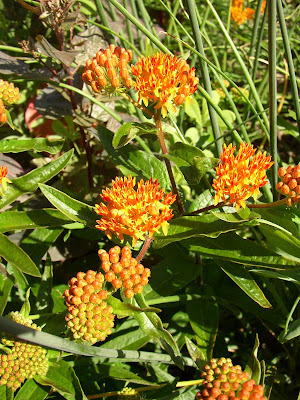 I don't know why Asclepias tuberosa is called butterfly weed. I've rarely seen any butterflies on it. Mine's sometimes been defoliated by tussock moth caterpillars, but that doesn't count in my mind. Great looking jungle! Is that a Miscanthus sinensis at the far end of the "jungle". That's a lovelly grass, I want to try it one of these days in my garden, I hope it can stand the drought. And the blue clematis...lovely! Entangled, no, I haven't been there in person. I have received their catalog and was lucky enough to find a local garden center that carried their organic herbs and a few of their alpine plants this year, though. They aren't too far from where I live, and I would love to have an excuse to visit them--and meet you--so if you happen to revisit that visit idea at any point, let me know! gintoino, it is a miscanthus. Variety unknown for sure, but it's either 'Zebrinus' or 'Strictus' because it has the horizontal gold banding. (I'm leaning toward the latter, but not having seen 'Strictus' in person before I am not sure if mine is quite upright enough.) Either way, it can definitely stand the drought! I want some of that next to my Clematis tangutica 'Radar Love' The blue would go nice with the yellow. Blogs are like catalogs. Sooner or later you'll run across a plant that you just have to have. The only problem is blogs don't have an order form.